3 Bedroom End of Terrace House For Sale in Penzance for Guide Price £185,000. 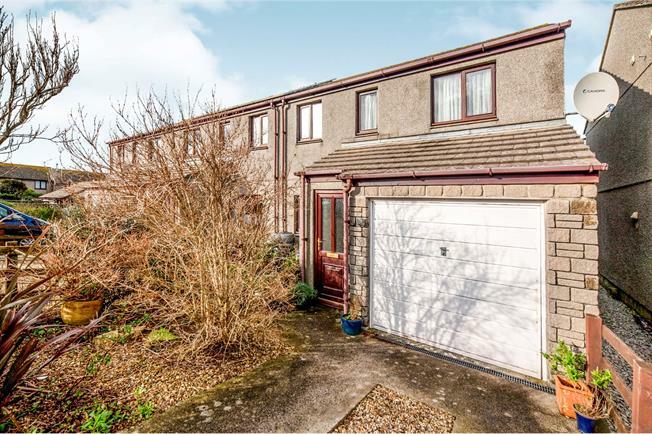 This end of terrace property is presented in good decorative order and comprises; entrance porch, kitchen/dining room, and lounge with doors leading to spacious conservatory/sun room on the ground floor, with the first floor hosting three bedrooms, and bathroom. The property also has a garage with an up and over door to the front of the property. There is a fully enclosed garden to the rear which is paved and low maintenance. The property is warmed via oil fired central heating. From the entrance porch a door opens into the kitchen with double glazed window to front aspect, range of base units, cupboard. Radiator and door to lounge. Double glazed window to rear aspect out to conservatory and rear garden. Radiator, stairs to first floor and door leading out to conservatory. Fully UPVC double glazed with doors opening onto the rear paved and fully enclosed garden. Radiator. Obscure double glazed window to rear aspect, with standard suite comprises of; bath with shower over, W.C, wash hand basin and radiator. With up and over door to front. To the front of the property is a paved driveway providing off road parking and a range of various shrubbery, to the rear aspect is a fully enclosed paved garden with various shrubbery.